The Simple Life of a Queen: A Wonderful Weekend Indeed! Hello everyone! We had a wonderful, wonderful weekend at our house and it was because of these two sweeties. This is Kyleigh and Caleb, our two Montana grandkids that came to visit along with their Daddy for the weekend. Uncle Alex had left some Japanese goodies for them at his last visit. Here Kyleigh is wearing an authentic hat that is used in the rice paddies in Japan. Alex wore it when he lived in the north and helped at his friends family farm. Aren't they they cutest kids? They love Chloe but wear her out quickly. She's 10 now and can only go so long before a nap is needed. The kids have LOTS of pets at home so they're great with her. Should I give you a list of their pets? 11 chickens, 9 quail, (they hatched the quail from eggs and now they follow the kids around the yard! ), 2 Indian runner ducks, (the tall ones that run like a person! ), that think Kyleigh is their mom so they follow her everywhere. Those are the outside animals. Inside are 3 parakeets, 2 cockatiels, 1 frog, 1 beta fish, 1 lizard and 2 dogs, a Labrador and a Visla. And they live in town not in the country! It IS Montana you know. Not unusual at all. We had a wonderful time at the lake swimming with Grandpa! Look how crowded the beach is. It was almost 100F Saturday and Sunday. There's our son, Jamie with Kyleigh. After swimming we headed to McKenzie River Pizza Company for dinner. They have great pizza and have lots of gluten free options. You might remember that both the kids and their Mom have Celiac's Disease. I can't believe how much they've grown and how much better they feel since they were officially diagnosed and removed gluten from their diets. Meanwhile, Brad, Mandy and Piper are in Nebraska visiting all of the relatives there this week. Our extended family and Brad's family only live 20 miles from each other so they get to see everyone while they're visiting. 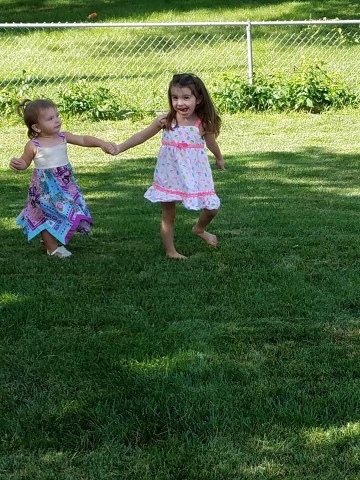 Here Piper is playing with her third cousin in Dennis' Mom's back yard on Saturday. All of the cousins were able to be together with their kids and spouses except our two boys. We face-timed with them all Saturday night so Jamie got to visit a little too. Yeah technology! Piper and Aria had a lot of fun playing even though Aria is a few years younger than Piper. 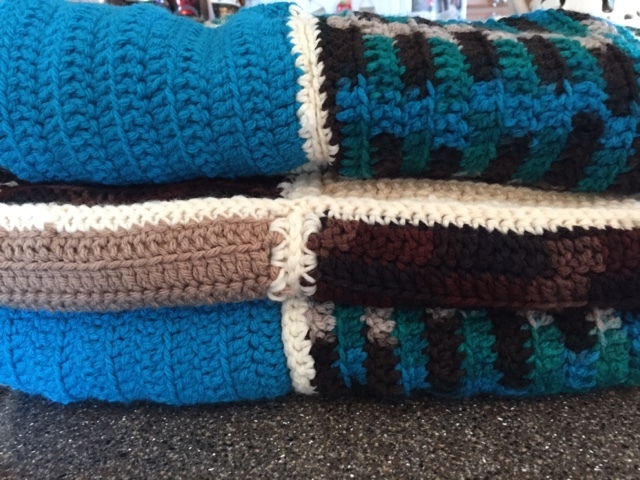 On the crafting front, I finished three more blankets for the Crisis Nursery with the squares I showed you last week. And one brown. Nita told me she left another box in our trailer last night with squares for another blanket. I joined a dishcloth swap and look what I got! In the mail! 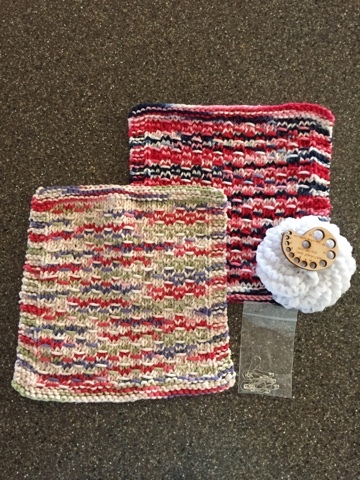 Two beautiful dishcloths, a scrubbie, needle gauge and progress keepers. I love everything and now I don't have to make another scrubbie soon like I thought I would! Yay! I've wanted another needle gauge and to try those progress keepers. It was like my swap partner could read my mind! The pattern on the dishcloths is one I haven't seen before and I really like it. Thank you so much Nancy!!! I will definitely use everything. Another sweet package arrived last week from Tammy in Kuwait. 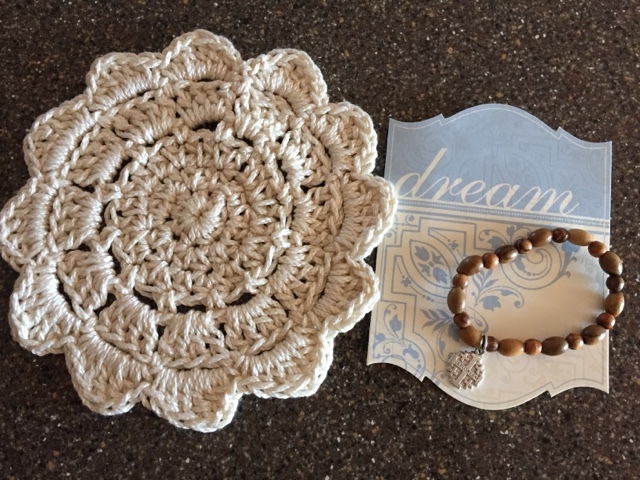 She made me this precious doily and sent a bracelet made from Olive Wood from Jerusalem. I love them both. How absolutely lovely of you and I thank you so much Tammy. On a serious note, along with the horrendously hot weather we've had for a couple of weeks, we had winds in excess of 35 mph yesterday. It has sparked wildfires all around us. While today is much cooler, the fires are still burning. We can see the one below burning just 3-4 miles to the east of our house and the smoke is billowing as we stand on our deck. 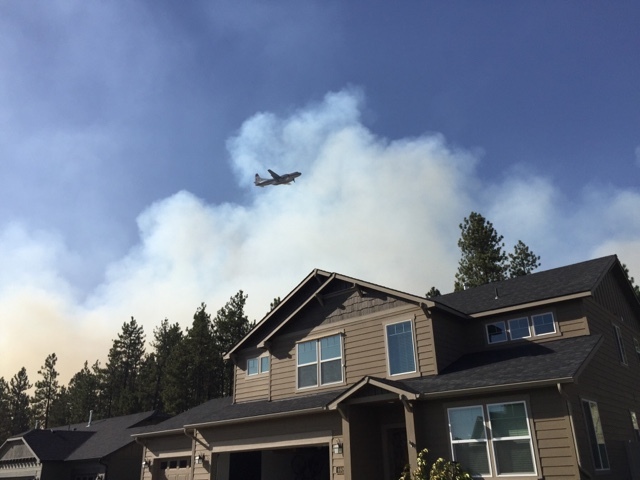 There are also two fires to the west of Spokane burning and one town was entirely evacuated last night. Our house reeks of smoke...but...this picture? This is Paul and Lori's house, our lake buddies whom we've known for almost 25 years. Paul was on the roof last night hosing down the roof. Lori is at the lake because they won't let anyone in to get things from the houses unless they're already there. That's a water tanker flying overhead, dropping water on the flames. So, while the smoke is irritating my nose, eyes and throat, I am NOT complaining. Please say a prayer for all of the people in harms way of these and the fires in California and the flooding in the south. Mercy. The world seems to have gone crazy. On another subject, go to the cardiologist this afternoon for a follow-up visit and I'm going to ask to be taken off the "no fly list!" Ha! Seriously, he hasn't wanted me to fly since January when we had to cancel our cruise. He did let me drive to Portland, OR to see my blogging friends this spring because there were hospitals along the way. I want to go see Piper for her birthday next month. This Grandma NEEDS to get her hands on that girl. I have had an entire week of no dizziness. SHHHHH! I did not say that out loud did I? I don't want to jinx myself! So, I'm very hopeful the meds are working now and my body has adjusted. I'm hoping he'll say I can go see my girls. And now, I've rambled on enough. I have a few projects going on but I'll tell you about them next time. I'm making another pair of socks for Alex for Christmas and a sweater for Piper. I'm hoping you're all having a wonderful week and that your summer is turning out just as you hoped. I think I've shared this verse before, but thought it appropriate today with the disasters happening so many places right now. Cooler weather last week and some snow in the high country has brought the local fires under control. The fire fighters were amazing, and even though cabins were threatened, none were destroyed. I'm weary of smoky summer skies. Certainly hope your heart has calmed down. Tomorrow is the third year anniversary for my pacemaker implant. I can't believe how much better I feel and how much more I can do with it. God is good. I love the cloths and all the goodies you sent me in the recent swap. I had fun - cloth pattern will be on tomorrow's blog post. I am so happy to hear you had a good week and a wonderful weekend! Spending time with the Grands is the best thing ever! Hi There, I can imagine how happy you were to get to see those grandchildren.. What a wonderful time they had with you all.. How SPECIAL. Hope you can 'fly' again soon. how happy for you to have two of your grandkids and your son visit! Sweet! Glad you are having a good time and still working on crafts in the summer. I've been bad about that! Praying you feel better soon, and hope the fires are extinguished soon. It was hot Friday and Sat with temps up to and over 100 in places, even the beach on Friday! WOW! Sunday was cooler and nice for our church picnic when it was only 82 degrees. Next few days cooler too! Praying that Friday will below 90 as we are attending an outdoor wedding. Last one of this summer! I always enjoy knitted dishcloths and don't like it when they were out and they don't all have to be purple since I have different colors in my kitchen towels. Hugs my sweet friend! How wonderful to have a visit from your son and Grandchildren, what fun they must have with all those pets. My thoughts and prayers are with all those people affected by the fires and floods, it really does make you so grateful. Hope all goes well with your hospital appointment and that you are able to fly. Take care. Looks like you had a wonderful week Betsy! Love the hat that Alex left for the grandkids. Hoping you get the thumbs up on flying. Looks like you had a wonderful visit with the kids and they are cuties. I'm glad the dizziness is gone and I hope the doc clears you to fly! Your grandkids are adorable Betsy, I think the older two look like you! Best of luck with your appointment, you are in my prayers my friend. Happy times at the lake Betsy. We are having our granddaughters on Friday - until Saturday as their mummy and daddy celebrate their 10th Wedding Anniversary. then next week our grandsons are visiting again as we are helping with childcare during the school holidays. Nice to see all your pics. It would have been a wonderful time with the kids. wow - you've been busy - the little blankets look great! So glad you and Nancy were sweet swap pals! How lovely that your son and grandkids were able to visit. I think it's great that they are growing up surrounded by so many animals. Certainly teaches them a lot about love, compassion and caring. Sorry to hear that you still aren't able to fly but eventually all the medical problems will be sorted out. Glad you received my small gifts. 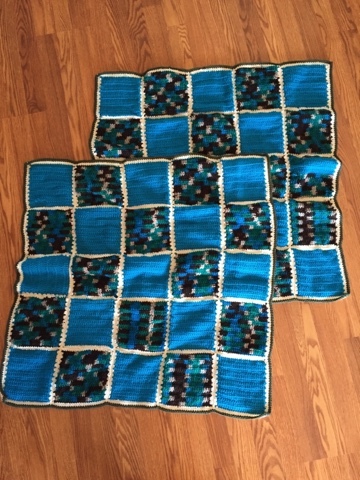 Think I'm gonna whip up some blankets like you are making, instead of the granny square blankets that I'm always doing. 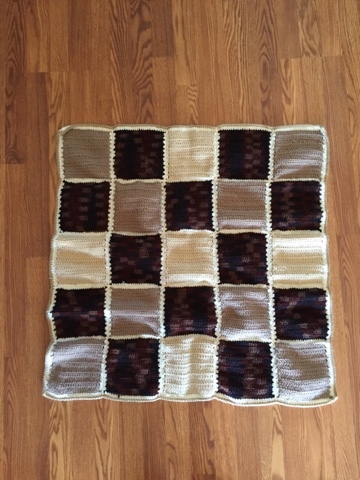 Simple squares and joining will be just as quick and easy. Bless you for all your wonderful charity work.